You make the most beautiful cards!! Anabelle, you card with GL is adorable! Love the collection and your card is beautiful. Oh wow your card is a true beauty...love the softness of it! Really like this blog hop so far. Your card is so beautiful ! Love it! such a pretty collection! and your card is very lovely! This card is beautiful!!! off to the hop!!! This is just so pretty, and light and soft! Love the embossing and that doily cut out that you added. The bling is so pretty, but not over the top. Just beautiful! Sweet card and lovely collection! Very beautiful collection. So girly!!! I love our card. Thank you so much for the inspiration and the HOP! LOVE this collection! BEautiful card!! Anabelle this card is gorgeous! beautiful collection and beautiful card! thanks for sharing! Beautiful cards! I just adore this collection! Your card is very beautiful! Girl Land is just amazing! Love this beautiful card..so delicate and soft! So pretty and softly feminine. I love it! I love the doilies and the bling across the top is a perfect touch. Such a pretty card! Gorgeous card! Love how delicate it is and the bling. Sooo feminine; love the colors. Beautiful card! I love the collection! This card is so sweet with all the soft colors. That is a really pretty card. I love this line! Oh my. Your card is gorgeous...I love it. What a beautiful card! I love the doily and the felt flowers! All so girly looking!!! :) Thanks for sharing. I would have thought felt would be too bulky for a card but yours turned out wonderfully! Beautiful card!Love that white flower. This card would definitely make me feel better! How pretty! Love love love this line! i like this card...the texture and demention is awesome!! BEAUTIFUL!! your card is so elegant, thanks for sharing! Such a pretty card, Annabelle. Love your cut work and the twine with the ribbon. Such shabby chic beauty!! Just lovely! Stunning card! I Love it!! Truly BEA*U*TI*FUL!! LOVE the bling! That's a great card and I really like the collection as well. I can't wait to get it and then head out to my room from http://roomstogrowusa.web12.hubspot.com/hobbyrooom/ and play! Your card is beautiful. I'm just getting into cards and am always looking for inspiration! Your card is so sweet and feminine! I love the flower and all the trim. The collection is perfect and the work you were lovely! I love the brand. And when the theme of the collection is a girl, I like even more! Your cards are so cute with the new line!! Oh what a pretty little card. Thanks for sharing it. Love your card! Love the Collection too! Lovely card. I love the split doily idea. 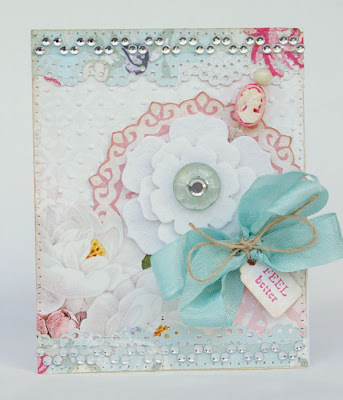 Beautiful card and lovely soft colors. Your card is beautiful! It would make anyone feel better. What a gorgeous button! It looks vintage! What a gorgeous card and great use of the collection. Can't wait to see what's next. Gosh I just love this collection! Oh this card is so beautiful! I just love how calming it feels, it would give anyone a sense of warmth and soothing! What a cute card you make. That's such a lovely card. I really like the tag tied around the bow. A beautiful card. You can send it to me if you want - I'd be honored!! Love, love, love, all things girlie! This card is beautiful! I love all of the bling and the felt flower is fantastic. Just the perfect amount of bling and girly look. Beautiful card! I love the felt flower and the ribbon you used for the bow. Really lovely card! 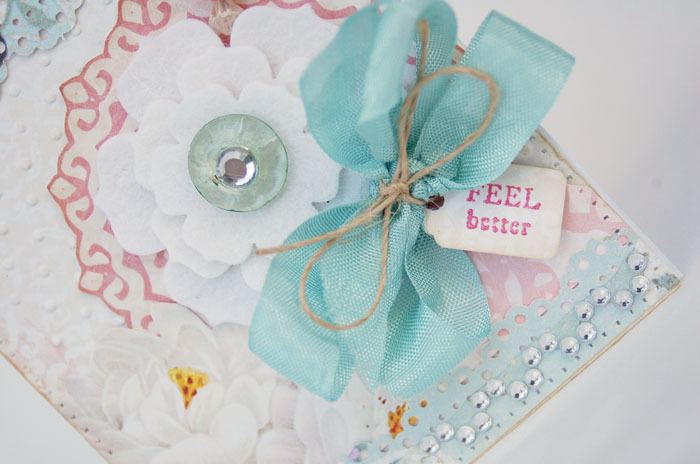 The papers and embellishments are wonderful! Stunning card! Love the soft delicate layers and fab pin! TFS! Beautiful color scheme to this set! Annabelle, this is absolutely gorgeous! This collection is gorgeous, and so is your card!!!! This new collection is a must have! Love all the papers and the accents are just awesome. the soft muted colors are so romantic! As always, your card is so beautiful! I love the soft colors! 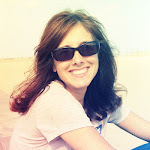 many thanks for the blog hop!!! Gorgeous card, love the soft colors! Wonderful card! Love this collection! So pretty and soft colours. Loving this new collection. That is an incredibly beautiful card!! I hope that you would not mind if I scraplift it??? WOW the collection is so beautifully!also your amazing card love it !! So pretty...the collection and the card! Your card is stunning!!! This collection is beautiful! I love your card. The border punch and all the little details are beautiful. That card is gorgeous. You are very talented. so beautiful! I just love Webster's Pages - so beautiful papers! Beautiful soft colors. Love the bling! This is beautiful! I love the flower and this line has won my heart! Thank you! Beautiful card Annabelle - love your work! Great colors. Love this collection. Gorgeous cards. Beautiful collection with my favorite colors. Gorgeous card...too pretty to give away! I'd have to keep anything I made with these pretties! Love your beautiful card!! This collection is so cute and pretty! The card is beautiful!! Would so love to give or receive a card like this! The card is so pretty! I like the sparkler and gems. Can't wait to see the collection in person. Love the card! So great! The new papers are gorgeous and your card is so beautiful! so pretty! love the embossing and layers. WOnderful card!!! I love this style!!! Beautiful card! So love the Girl Land Collection! Oh my that is such a delicate card. I just love the papers & that focal flower is just gorgeous. What more can I say wonderful. Love your card ideas. Such pretty new papers. Gorgeous. I love the delicate palette. I love the layered flowers and the soft colours! Wow! this is gorgeous! beautiful colours and layering! Love the borders & bling! Beautiful card! Love the color, and loveliness of it! Wow Annabelle, your card is just stunning! You work magic with this collection. The reason I LOVE WEBSTER'S PAGES is because everything is so BEAUTIFUL and the quality feels so great to the touch! 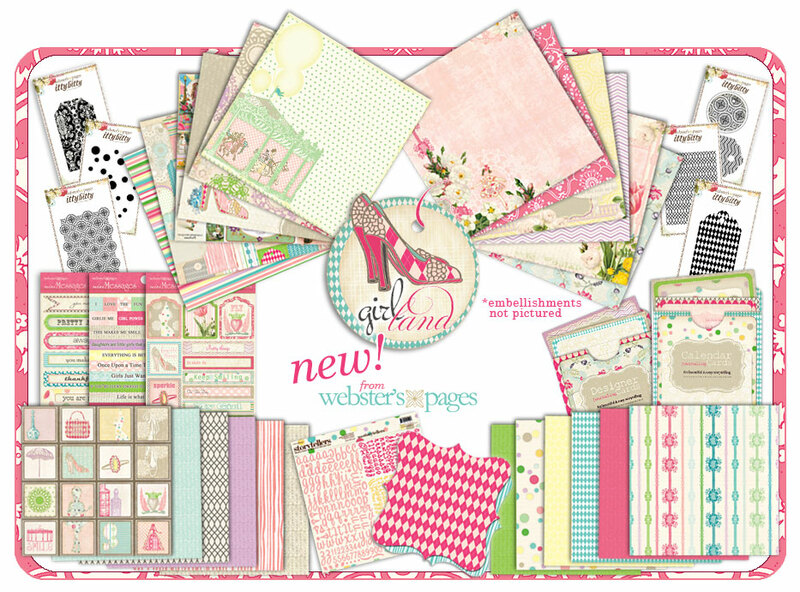 Webster's Pages makes any scrapbooking or alteration project look and feel luxurious! And your cards are no exception..very gorgeous and girly! So in LOVE with all the collections from Webster's Pages! Great card designs. I cannot wait to try them at home. That card would make me feel better! Beautiful card, love that bow with the bling in the center... so very pretty. I just want to touch it! Thanks for the inspiration and motivation! Thanks for the chance to win! !